As part of the 2010 Blogathon participants do a post swap. Dana Dugan, who blogs at Chick with a View, and I traded posts about traveling in Japan. Here Dana remembers a night of exotic dining in Tokyo. My post about a recent walking tour of the Yanaka area of Tokyo can be found at her blog. Enjoy! 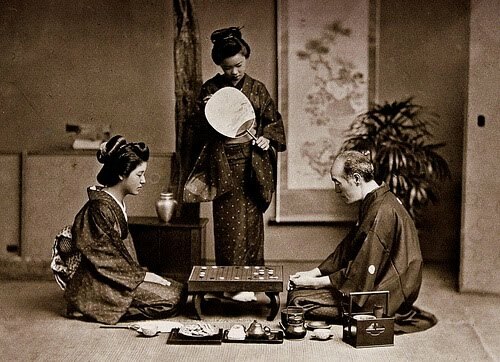 I have never played Go; an ancient board game invented in China but considered the national game of Japan. But once when in Tokyo, I had dinner with a man, known to me as Ito-San, who was the head of foreign relations for the game, and the director of the biggest Go parlor in the world. Or so I was told. I was in my early 20s, and on the tail end of a six-month long round-the-world trip. I was traveling alone and along the way I would meet various people who’d invite me to visit them, or stay with them. In China, I met a guy named Murph. We were on the same tour. In the early days of China’s borders being opened at last, being on a tour was the only way a foreigner could travel. It was how the government kept track of us foreigners. Murph was a sports guy who worked for the American Embassy in Tokyo. Upon hearing that I would be there in a few weeks, he invited me to stay with him and his wife and very young children. I arrived there in early-December when it was cool and crisp, and startlingly beautiful. The bones of the gardens at the Imperial Palace were an awesome sight for its grandiosity and simultaneous serenity. The streets were clean. The people were unfailingly polite and the subway system immaculate and effective. Once I left my camera on the subway, realized it and ran back. The train hadn’t left the station yet and the bulky SLR sat on the overhead bin right where I’d left it. Because of his sports job, Murph was friendly with Ito-San, the “minister” of Go. We met at a bar, and preceded to a Kaiten-zushi, where fresh sushi rotates by customers seated at a bar on a conveyor belt. We took a few plates and then moved on. This was completely new to me but with a little help from Ito-San I was treated to delicious taste treats. The price of the meal is calculated by how many plates the customer has in front of him. Brilliant. Why don’t all restaurants work this way, I wondered? We slipped out of the Kaiten-zushi and walked a block or two before darting into a plain curtained doorway. With so few tables, perhaps six at the most, Murph and his wife were at one table, Ito-San and I at another. He spoke to me in perfect English and told me everything I was eating. It had been my rule on this journey to eat whatever was given me. It led me into some odd places for sure—fried chicken blood in France, for instance. That night topped it for me, however, with one particular dish of raw meat. I looked at him suspiciously, “What is this?” I asked. Now I have a rule never to eat anything I’d had as a pet, with a name. That includes bunny, dog, cat, horse, mice, squirrel, chipmunk and turtle. I politely turned it down. I did acquiesce have a bite of raw pig, however. Not to my liking, and I have never have repeated that experience. A few dishes later we again exited by a back curtained door into another alley and into yet another restaurant. This went on for a few hours. From one to another, more sake ensued and a lot more talking. 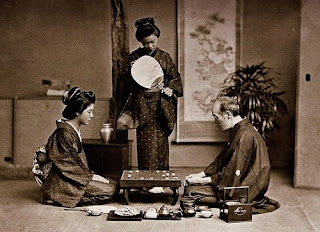 I learned (and promptly) forgot all about the game of Go. Everywhere we went Ito-San was well-known. I never saw money exchange hands. He showed me at one point where to buy an antique kimono, which I did later that week. It is pale pink with a blue obi (belt). I have worn it several times to great affect since. The next day we got the news that John Lennon was killed on West 72nd Street in New York City. I lived on the same street just two blocks from his home and saw him, Yoko and baby Sean often. It resonated with me but not my hosts who hadn’t lived in the States for some time. Young Japanese people desperately wanted to connect with me. I took the bullet train to Kyoto and met more people I have never seen or heard from again. It was the other side of the world. What an excellent guest post!! I loved following you around in the back alleys of Tokyo!! Great memories!! Thanks Joan for setting up such a great blog exchange!! I love your blog! It was a fun one, wasn't it? There's so much in the post that I could relate to, too, and that I've also done/eaten. I like learning about other people's experiences traveling here (and other places, too! ), as they're always so interesting. I'm so glad you like the blog, Anjuli! Thanks for reading and commenting. Joan, it looks so nice. thanks very much for exchanging with me. I'll be checking back often to PopcornHomestead. No worries, Dana! 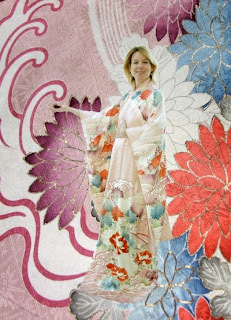 I really enjoyed reading the piece, and I'm assuming that's you in the most awesome kimono? Thanks for the great writing. Sprouts! The Rice has Sprouted!